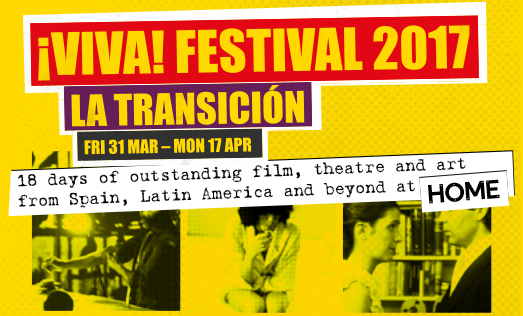 The Spanish and Latin American festival celebrates its 23rd edition in Manchester from 31 March to 17 April with a varied offer of international theatre and dance performances, art exhibitions, live music events and films. This year A?Viva! focuses on commemorating the cultural revolution that followed the abolition of censorship in Spain forty years from now. The Spanish transition to democracy after the end of Francisco Francoa��s dictatorship, is represented at the festival by a series of relevant events and films from that period such as the cult movie Pepi, Luci, Bom directed by Pedro Almodovar or Seven Days in January by Juan Antonio Bardem. A pioneering group visual art exhibition called La Movida presents works that explore the sense of freedom, hedonism and transgression that characterized the Spanish counterculture movement. The eclectic film programme of A?Viva! 2017 includes 15 UK premieres and films from 10 different Spanish-speaking countries as well as debates and filmmakers Q&As. The film discussions will specially focus on contemporary female cineastes and the Basque film industry. CafA� Cervantes is an informal meeting of film lovers led by staff from the Instituto Cervantes. Ita��s one of the most appreciated events of the festival and a highly praised gathering for those interested in the Spanish language and cinema. This is a great way for our students to practice their Spanish chatting with native speakers in a relaxed environment. If you are not sure about your level please take the user-friendly Spanish level test on our website. To find out information on any of our Spanish courses Manchester, or just general advice on Spanish language learning, or how to start your language learning journey, please call us on 01273 830 960 or email us. Our multilingual team will be happy to answer any questions you may have. Next Next post: April is Turkish Month!